First bio spray of the year at Forge Cellars. I call it Vineyard Sauce because it smells like Thai fish sauce. While the winemaker's fermentations are done in beautiful French oak barrique, the vigneron's fermentation is taking place in recycled plastic barrel. After 4 weeks in the cellar, my brew of Effective Microbes is ready to spray on the vines. These microbes have been selected for their ability to contribute to plant and soil health. Sort of like a probiotic for the vineyard. Also in the mix, organic fermented fish from a family farm in North Carolina. This contains essential fatty acids which the microbes need, as well as nutrients for the vines. Farms rarely post pictures of spraying on their social media...consumers might be shocked at the behind the scenes look at chemical agriculture. But I am posting this picture because my bio spray is a joyful occasion. As a mom, I love cooking healthy food for my children with high quality ingredients. As a farmer, I feel like I am doing the same thing for my plant children. As a caretaker of this vineyard, I get to be there when the sun rises over the Hector backbone on this glorious day in early May! Have you met Autumn Stoscheck? She's the powerhouse behind Eve's Cidery, farmer extraordinaire, orchardist turned vigneron, and generally just a badass lady. Autumn is on sabbatical with the cidery and working with us to develop our biointensive home farm. Her methodologies and holistic approach to the land echo the philosophies of Forge and Saint Cosme, while also bringing a unique perspective to the mix. Throughout the season we will share some highlights from the vineyard, and bring you along to explore the terroir of our site. #1 Vine prunings from 3 acres of 3 year old vines, the pit, and my fire starter. I dug this pit in 2 hours with a front loader on a little Kubota and hand held hoe. It's cone shaped, 3' deep in the center with a 6' radius up top. #2 Started a very hot fire with scrap wood from old pallets. #3 When it was raging, I began adding the prunings. The trick is to continue to add as much fire as possible with out smothering it. 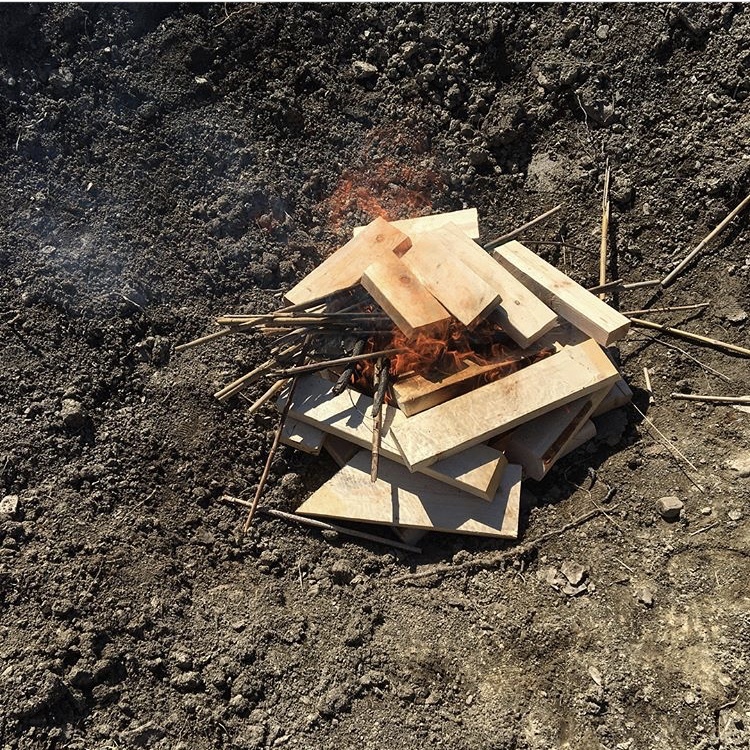 #4 Fire burns twice, first making charcoal, then ash. The cone prevents air from reaching the bottom of the fire, leaving behind the charcoal. The fire is so hot it makes no smoke, only steam. The pit was full when I threw the last of the vines on the fire. #5 Luckily our sprayer only uses organic certified materials, so I had a convenient method to pump the 100 gallons of water that the fire required to quench. #6 Apx 200 gallons of high quality, uniform biochar ready to inoculate and add to our compost pile to be returned to the vineyard. Why do we make Pinot Noir? True, with with our variable weather patterns and cool, northerly climate, nothing is easy here; certainly not the fickle, seductive beauty known as Pinot. But we have always had the confidence that if we chose the right sites, balanced the yields, worked with dedicated growers, and paid attention throughout the season, we could absolutely achieve excellence. Notice I have mentioned nothing about the winemaking, which must be watchful, disciplined and intensive. This past fall, Justin and I used our brain power and brute strength to figure out how to break through the foot-thick cap of grape skins to punch down our Pinots. Louis haranged us day and night about fermentation temperatures, and we bit our nails in suspense over whether our French barrels would arrive from Santa Rosa, California while it was burning from wildfires. Seneca Lake Pinot Noir truly excites us and gets us up in the mornings. We believe it is possible to translate our terroir into a sublime glass of Pinot. Some of the very factors that deter and stymy are those that have the potential to make our version so compelling. We continue our quest for finesse, delicacy, seduction and charm, and we invite you to come along on this journey. Such is our confidence in the variety here, that in 2016 and 2017, we planted ten acres of Pinot on our home farm. 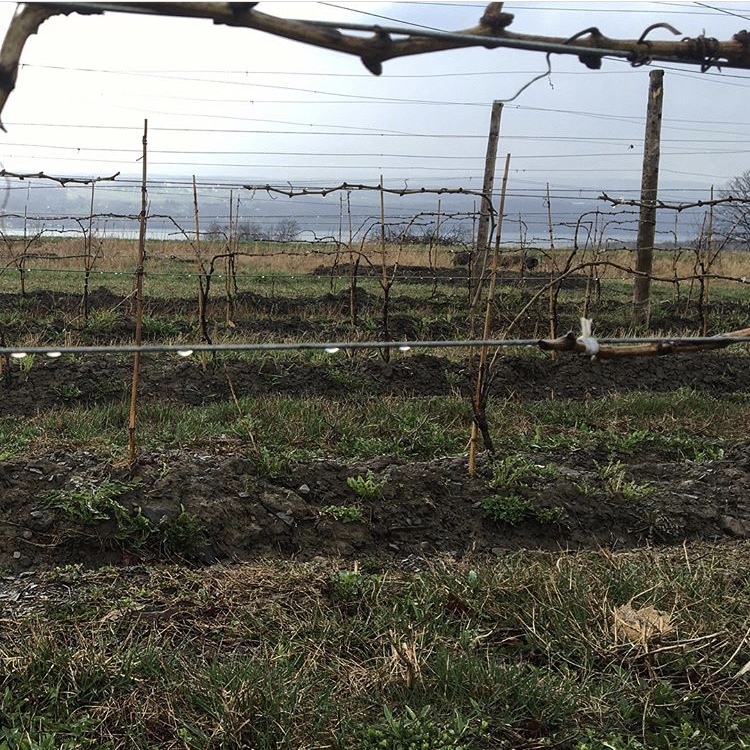 With the help of our Vineyard Consultant, Phil Davis (Damiani Wine Cellars) and our vineyard team, which now includes Autumn Stoscheck from Eve’s Cidery, we look forward to raising our young vines in the most eco-friendly and balanced manner possible that they might tell you a brilliant Finger Lakes story one day. If you like Burgundy, we think you will especially find our Pinots attractive. These are wines that reflect their delicate and gradual Finger Lakes ripening and their foundation in shale soils. They are alive, expressive and mysterious, unfolding at will. I'll be heading to Burgundy for inspiration and wisdom from the holy grail of Pinot Noir in just a week, so stay tuned for updates, and in the meantime, check out our newly released and rated Les Alliés 2015.